The Arizona Compliance Bundle will provide streaming video and audio courses which, when completed, will yield 15 hours of Interactive CLE credit including the 3 required professionalism credits which you may apply toward your annual CLE requirement for the State Bar of Arizona. Every year by June 30th, Arizona attorneys are required to complete 15 hours of CLE, 3 hours of which shall be in Ethics or Professionalism. 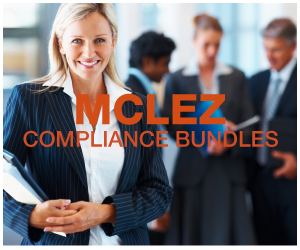 Through interactive Continuing Legal Education courses, attorneys may fulfill the entire requirement through MCLEZ. MCLEZ activities may qualify for credit toward your annual CLE requirement for the State Bar of Arizona under Regulation 101(G). The State Bar of Arizona does not approve or accredit CLE activities for the Mandatory Continuing Legal Education requirement. For more information, please read the Arizona CLE Board Regulations on their website, or call 602-252-4804.